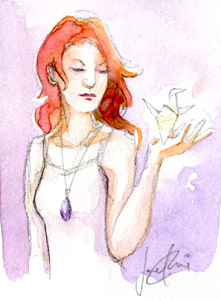 Paper Crane: A 2-by-3-inch watercolour sketch from April 2014. The problem with perfectionists, when they’re working for themselves, is that they’re hard to please. And so, when given a job, whether vaguely described or exactly detailed, they will set standards to achieve that may or may not be feasible with the time and resources allowed, leading to completion dates that are either never set, or never reached with 100% satisfaction. The most devastating thing you can do to a perfectionist is to notice, and point out, the flaws that they either painfully decided to accept (in preference for their sleep/sanity), or that they wanted to fix, but ran out of time and hoped no one would notice. The perfectionist does not slack, but always puts in extra time and effort. Workaholism is almost a noble addiction, and looks good on the resume, too. I was a self-proclaimed and proud perfectionist for a long time before I truly understood the huge physical and emotional toll it exacted. Barring the critics (intentional or not) who can depress a perfectionist’s spirits, I’d hazard to say that the work produced by one is usually above average, but seldom shared with pride, because all the perfectionist can see is still its flaws. Most of those flaws may never be spotted by the majority. Praise helps, but shouldn’t be counted upon, and, as I mentioned, criticism can be devastating. It is all part and parcel of one’s ego and identity being wrapped up in one’s work. There’s (quite a bit of) victim mentality, a persecution complex, and constant projection and dissatisfaction. It’s not a problem I’ve gotten over, but I’ve become aware of its patterns, and have haphazardly enacted some detachment strategies. Because after decades of this, I’ve found it’s far more effective managing people and my reaction to criticism, than to immediately jump on the never-ending list of desired fixes (and it can truly be endless) whether contributed by the other party or myself. (Note to self: My time is limited and I really need to start charging clients by the hour for hopelessly nitpicky stuff.) Some chess strategy is required as well: the ability to anticipate indecision, and having to spend extra time “showing my working” (the ways one arrived at the choices made) because not all the weighings and challenges in the work process may be apparent to a viewer. While in the end the client may be always right, there may be some comprises leading to a result that I ultimately don’t want credit for, much less to put it in my portfolio. At Samsara Sunday 5 in March, I had the pleasure of meeting Melissa, who gave me a quick overview of my astrological profile (for a very affordable fee!). One bit I loved was when she mentioned my work ethic, and I laughed when she said that what I had was not usual, and I had to stop assuming everyone worked like I did. It was exactly the lesson I’ve been grappling with for my career. (The people with whom I’ve shared to this story also confirmed it with “yep that’s you to a tee.”) The first step to solving an issue is identifying it. So it was a bit strange after this weekend to feel “full”–full enough of training and learning, and feeling the push to “go forth now, you’ve got everything you need”. It was an entirely new feeling, which was–of course!–accompanied by some doubt, but still wonderful. In many ways I don’t feel that the counter to an insecure ego is the suppression of it, but the learning to relax and hear the other supportive voices around. And for that, I am grateful to my (presumably hoarse) guides and friends.